It was an incredible weekend of playoff games for the NFL — three of the four games went down to the wire, finished off by the Cold Bowl in Green Bay on FOX, won by the 49ers 23-20 on the last play of the game. The Saturday games, won by the Colts and Saints, were decided by a total of three points. Only the Chargers’ win over the Bengals on Sunday wasn’t close. But almost as amazing was the officiating this weekend. It couldn’t have come at a better time, and I’d say it was the best officiating I’ve seen all season. And make no doubt about it, the weekend ended with a tough game to officiate. The elements in Green Bay alone created that. 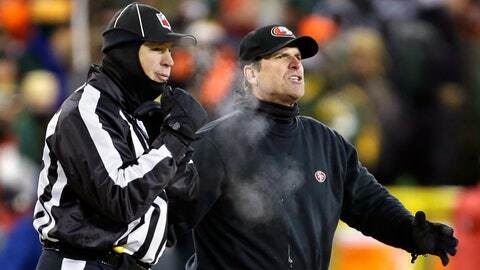 For referee Ed Hochuli and his crew, standing out on the field in minus-15-degree wind chill for more than three hours is tough. Were there misses? Yes. Were the officials consistent? Extremely. And that’s the good news. Sure, the officials did miss some down-the-field contact in terms of defensive pass interference and defensive holding. They also missed an offensive hold against the Packers on a big play in the fourth quarter, when Aaron Rodgers scrambled and completed a pass for a first down. But I do have to say in these types of conditions, the one thing the officiating crew strives for is consistency. There were seven fouls called and five were accepted. Such was the trend for Wild Card Weekend. The totals for the four wild-card games were 33 penalties called and 31 accepted. That’s usually the case when you get to the playoffs, when the better, more disciplined teams are playing, you get fewer penalties. No replay reviews in this game. All of the calls that had to be made in the catch and no-catch area were made correctly, and that crew should be complimented for that. This was a really tough game to officiate. My overall grade for the game: B.
I think that is a fair grade based on the consistency, even though there were a few misses in the game. My hat’s off to Hochuli and the entire crew that worked this game. I can’t begin to tell you how difficult it is to work in these types of conditions without getting a break.